Think haute couture and images of haughty models in exquisite ballgowns made from extravagant, exclusive luxury fabrics come to mind. But it doesn’t have to be that way, as Dutch fashion designers Viktor & Rolf have shown in their most recent collection which is made from remnants left from previous seasons. Sure, the fabrics left over from couture collections are high end, but the techniques – weaving strips in, adding patches, using groups of buttons to cover up areas and add interest – could be replicated in just about any materials, so it’s worth checking these creations out for some inspo. 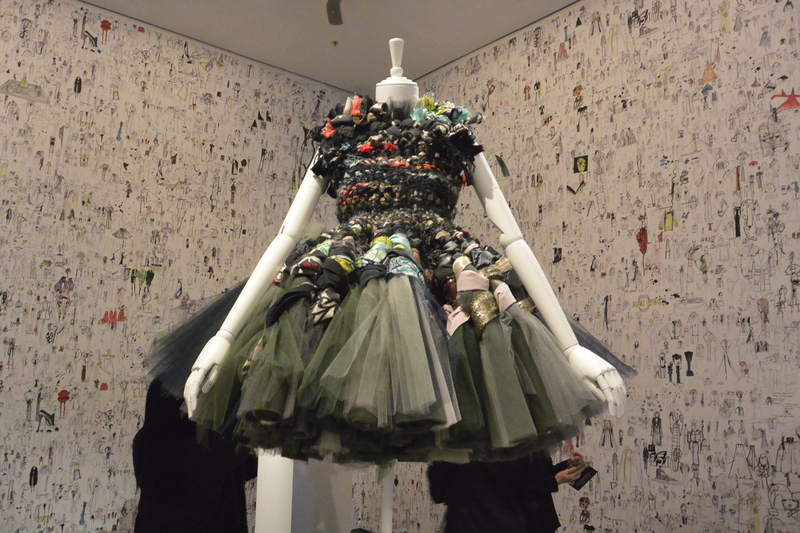 And if you’re in Melbourne, you can do that as easily as visiting the NGV, thanks to the Viktor & Rolf exhibition that’s on right now. 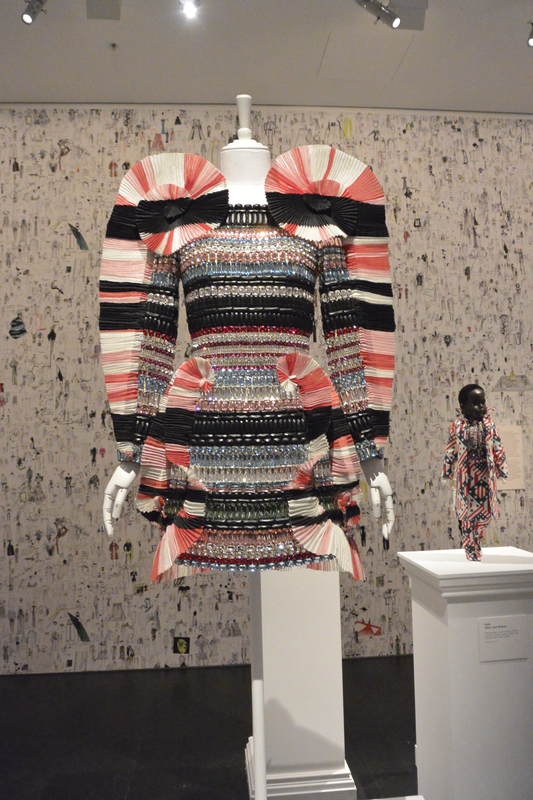 I was lucky enough to attend the media preview recently and hear the pair speaking to the curator, Thierry-Maxime Loriot (who also curated the Jean Paul Gaultier show*). Apart from talking about having loved perfume and its advertising since they were kids growing up in the burbs in the Netherlands, they also spoke about how couture is the best medium for them as it’s close to art, and advised struggling young designers (which they were, back in the day) to keep being true to themselves and pursue a unique path even if it seems crazy (and commercially unviable!). 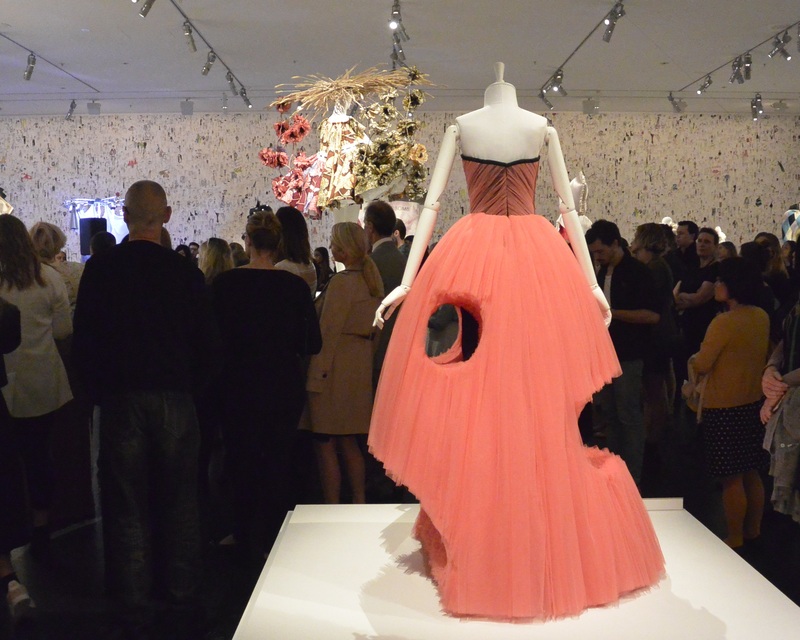 Viktor & Rolf have been in partnership for 25 years, so they have a significant body of work to base their advice on, a selection of which is shown in the exhibition. 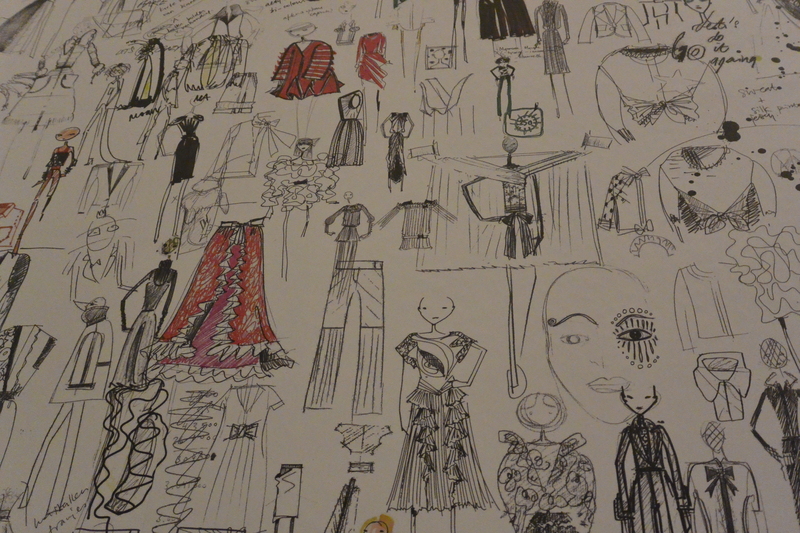 If the garment itself isn’t present, there’s every chance it’s on the walls in the form of sketches like these. 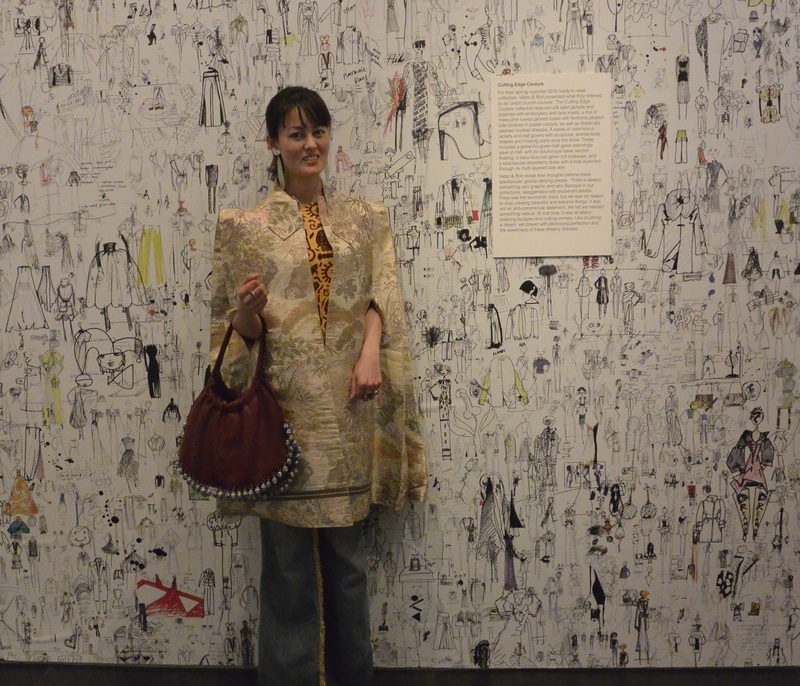 An entire room of the exhibition is covered in the designers’ sketches and comments! Talk about being surrounded by inspiration! Wearing the Japanese cape I found at the Salvos, plus Japanese ex-boyfriend’s jeans that he made with tinsel on the inseam. 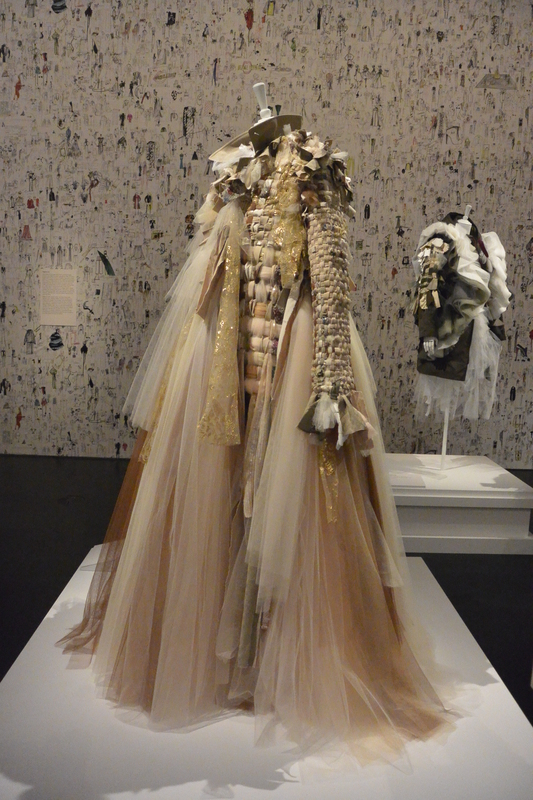 In the several years we were together, I never saw him cry – until, post-breakup, we went to a Viktor & Rolf exhibition in Tokyo and I saw him sneakily wiping away tears because he was so moved! 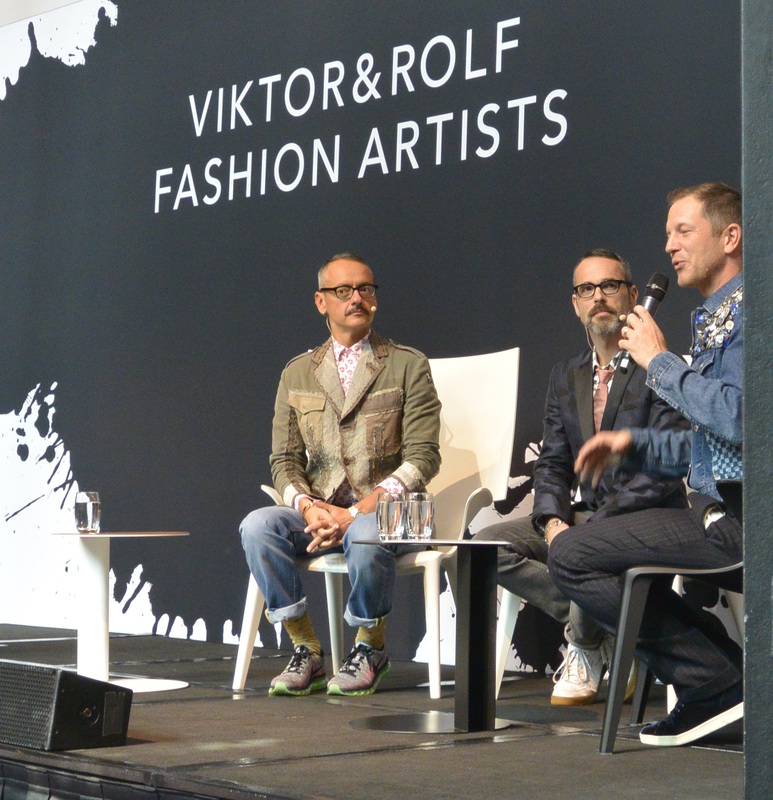 So I wore his jeans so that through them, he could kind of be in the presence of Viktor & Rolf themselves. I didn’t do a thorough look at the whole exhibition but there is certainly plenty to see, such as this crystal encrusted dress defined with finely pleated frills and this amusing (and technically impressive) Swiss cheese ballgown. *Sorry for the missing photos in that post, I still have to repopulate several of my older posts after mistakenly deleting the images! ← Who says weddings are expensive? It’s such a fascinating idea and a great example for the rest of us. I always keep my scraps to use for stuffing, but now I’ll be looking at them in a different light!